Like the sun itself, sunflowers are said to provide power and warmth. Perfectly sized for a desk or bedside table, these playful blooms will shine brightly in any spot. 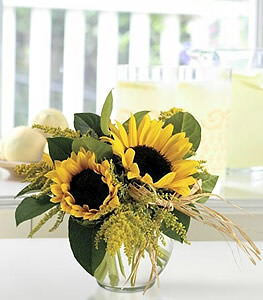 Sunny sunflowers, solidaster and lemon leaves are casually combined in a glass bubble bowl.